Symptoms: Pregnancy brain - I had to ask Adam how many months pregnant I am because after 45 minutes, I still could not figure it out! I also had a stretch mark scare, so I started to moisturize my stomach daily, but it turns out my veins are getting much more noticeable, starting on my stomach now so I am just having a hard time telling what it is. I am also loving the smell of bleach, I dont know if this is pregnancy related at all but I cant get enough! (they put out new sanitizing wipes at the gym for equipment and they smell just like bleach - dont worry, Im not sniffing it at home). 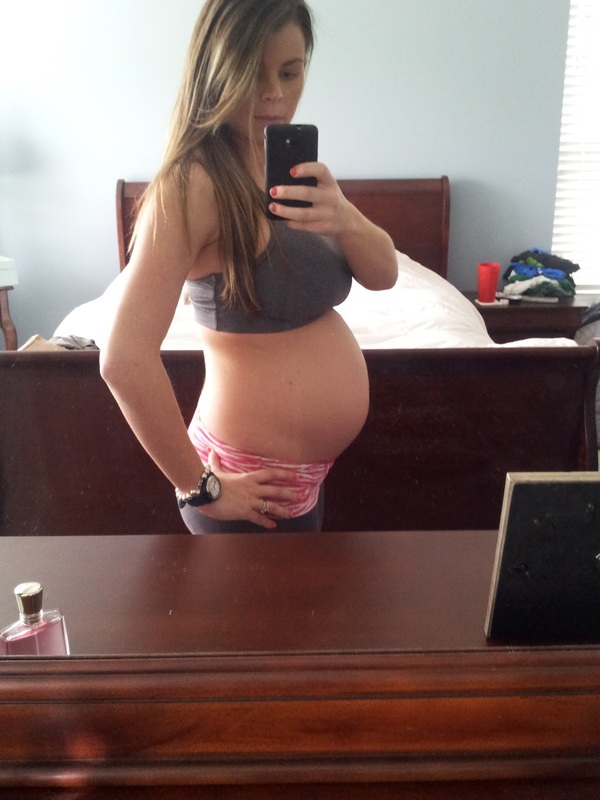 I also think its only a few weeks until my belly button starts to pop - it's getting pretty shallow in there! Weight Gain: Oh man, I was up 13 pounds as of Friday, and then superbowl weekend happened and this morning I was up 15 pounds. Hoping some of this is water retention due to sodium and will go away in a few days. I plan to stay longer at the gym today! Exercise: around 23 weeks I had to start slowing down on the treadmill - in addition to crazy calf pains I started getting cramps in my lower stomach when I would run, even after adding more of a 'warm up' to my routine. I continued to attempt running in week 23 but could only last 3 minutes at a time and it just isn't worth it. I am now walking, doing the elliptical, weights and yoga. Cravings: Sweets still. I had a dream that I had a coupon for Cinnamon Toast Crunch (because I wont buy it without one) and every time I see the commercial I want it. Luckily a few days after my dream I did find a coupon! Craving fulfilled. I also want cinnamon rolls, girl scout cookies and chocolatey cupcakes. Pinterest really has my cravings going. Aversions: Mexican is my only real aversion now I think. 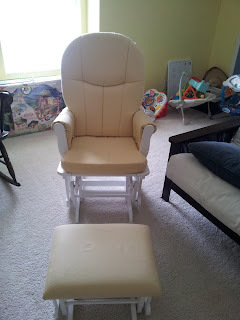 Prepping for Baby: Here's a photo of our chair, all put together. I am happy with it, it is a good size to not completely overwhelm the room and it perfect with the yellow and white. With our nursery coming together, I am really just waiting on my shower to come so that we can focus on all of the items that we will need to buy. I actually found a video monitor at Marshalls, reduced from $170 to $50. I was skeptical but it works great and I think it was there because it is last years model - It is a Summers Infant and I've seen this model before in stores like Target and Babies R Us. I am already starting to pack for my next trip (March 1st to Orlando) and think Ill have enough clothes to get me through, lots of tanks and t-s on repeat and I found a great pair of shorts from Pea in a Pod - pricey but definitely worth it as the ones I ordered from Old Navy were a total bust. We met with a pediatrician and I am just glad to have that out of the way now - not sure why but I was really dreading it. We found a practice with 3 locations, 2 which are really close to our house, and they are open every day. The Physician seemed really nice too, so I am happy with our choice to go with them. AND - I did start reading 'Goodnight Moon' to her each day - they say that if you read a book or sing a song that the baby will recognize it and be comforted when they are born. So this is a little experiment! Wow you're look amazing! Every time I read your posts I get inspired to add things to my to-do list and for the weeks ahead. How did you go about finding a pediatrician? Where have you been buying maternity clothes? Thanks! I am starting to get a little carefree with the food so am reeling it back in this week. I have gotten my jeans from old navy as well as my long sleeve tops from there. I also like the side rouched tanks and t's (order down a size in everything though). I hated their shorts so I got the pair from Pea in a Pod - they were like $70 but I think I can just wear that pair and be good, plus they are super comfy and fit ujust like regular old shorts. I like the GAP pure body t's as well. I order it all online when they have 30% off or something, then with the free shipping it isnt too bad. As for a pediatrician, luckily someone in my office who lives in my neighborhood told me about this place that she goes to. Otherwise I had just googled and was going with the most noteable practice in downtown. You go in for just a consultation so if you don't like them you can go to another one somewhere else.